You add hot, spicy foods to your diet because you enjoy the flavor, but you might be unaware of the possible health benefits of capsaicin, one of the natural compounds in these foods. Called a phytochemical because it's found in plant-based foods, capsaicin is responsible for the hot taste that can burn your tongue in dishes with spicy peppers. Capsaicin is also present in smaller yet possibly beneficial amounts in sweet, nonspicy peppers. Capsaicin is a compound that binds to receptors on nerve fibers that transmit pain and possibly heat, explaining its effect on the lining tissues of your mouth. It's present in peppers produced by certain pepper plants (Capsicum frutescens), including varieties called cayenne, green or red chili, spur or tabasco peppers, which contain especially high amounts of capsaicin. These varieties of peppers contain about 198,000 parts per million of capsaicin. Other types of peppers, generally called sweet peppers because they aren't hot or spicy, also contain capsaicin. Their content of the chemical is lower than in hot peppers, but they nevertheless are a good source of capsaicin when consumed regularly. Sweet peppers are produced by a pepper plant (Capsicum annum) that's different from the one that produces spicy peppers. These peppers are generally called bell, cherry, cone, green or paprika peppers, depending on the specific plant cultivar that produces them. Each of these peppers contains 4,000 parts per million of capsaicin, about 25 percent of that found in the hotter, more spicy types. Ginger root (Zingiber officinale) also contains capsaicin but only in trace amounts. Spicy peppers have been used as medicine by American Indians for thousands of years. Modern research suggests that consuming capsaicin-rich peppers may have significant health benefits. For example, a clinical study published in the July 2006 issue of the "American Journal of Clinical Nutrition" found that subjects who consumed chili peppers as part of different types of meals for four weeks had reduced levels of insulin after eating, suggesting that capsaicin might help lower risk of type-2 diabetes. 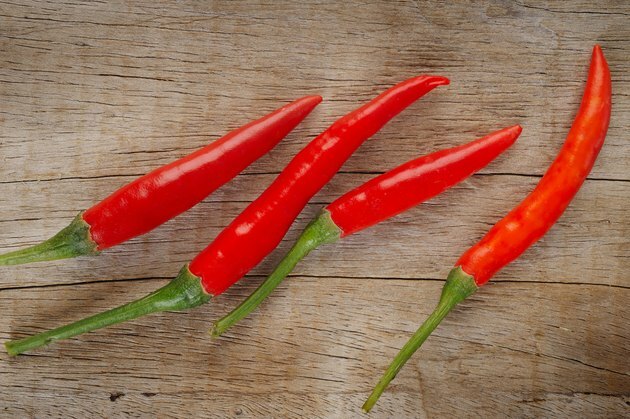 Another study that investigated the possible cardiovascular benefit of capsaicin, published in the March 2007 issue of the "European Journal of Clinical Nutrition," found that men who consumed chili peppers daily for four weeks had a lower resting heart rate and improvement in other markers of heart function than they had at the start of the study. Hot peppers containing high amounts of capsaicin can cause irritation if they touch mucous membranes, your eyes or any areas where skin is broken, so always exercise care when handling these foods. After handling hot peppers, wash your hands immediately in soap to remove all residue of the compound. Although eating peppers high in capsaicin is generally considered safe and poses no risk during pregnancy, don't consume them while breast-feeding because capsaicin passes into breast milk, according to the University of Maryland Medical Center. It's also a good idea to consume these foods in moderation to prevent gas or other digestive upset.